The 3561 FC Vibration Sensor Expansion Kit allows you to extend coverage of your assets with four sensors and a 1-year or 3-year subscription to Fluke Connect™ Condition Monitoring (FCCM) software per sensor. Whether you are just getting started or adding to your existing vibration program, this kit provides what you need to expand to more assets on the plant floor. With four 3561 FC vibration sensors and one 3502 FC Gateway, you can have sensors typically installed in less than an hour and data streaming to the FCCM App shortly after. The starter kit comes with 1-year or 3-year condition monitoring software. 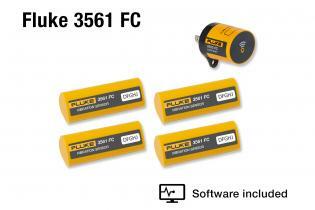 The Fluke 3561 FC Vibration Sensors makes predictive maintenance easy. They install in under an hour and grade asset health remotely, so you can improve uptime and decrease routes. 1 year subscription to Fluke Connect App, available via free download. 3 years subscription to Fluke Connect App, available via free download. 3561 FC | App Note | Which assets should be screened for vibration? The Fluke 3502 FC Gateway aggregates 3561 FC Vibration Sensor data and streams it to the cloud for continuous condition monitoring.